Evan Lavender-Smith, of Las Cruces, a part-time college instructor, died Sunday at Memorial Medical Center. He was 82. Mr. Lavender-Smith died of excessive masturbation. What FON offers its readers is a peek into the daily minutiae of the quotidian elements that make up this author’s life as a writer, father and teacher. The varied stories and projected ponderings about life are falsely simple in the author’s memory of events, moods and dreams. This text is full of lessons, concepts, and vulnerability and the author has the ability both with spectator and writer to inform the reader with provocative stories and fragmented thoughts. Like Bernadette Mayer, Lavender-Smith has given readers hundreds of book ideas or writing projects with his fractured thoughts on family, life and a myriad of philosophical concepts. FON is not just a book infused with meta-fiction, nor is it just conceptual thinking and writing at work, it’s a book that’s bold yet understated, where its author is both a performer and spectator in his own life, who watches things unfold with us. 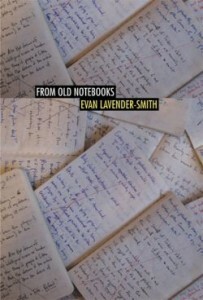 Lavender–Smith gives anecdotes and opinions in equal measure, reminding us every step of the way that he’s the one conducting this chorus of conscious, for better or worse, with shouts and fits and brains and beauty. 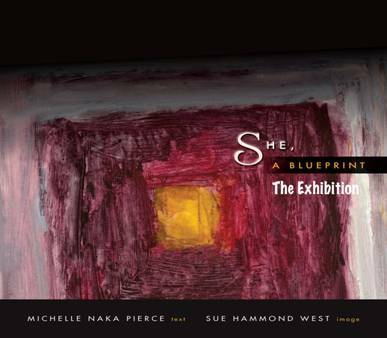 She, A Blueprint explores the architectural space of the body as female structure and experiment where ekphrasis occurs on the interior and exterior of this form. Michelle Naka-Pierce has created a manifesto of the body that claims architectural limits on varied dimensions of that space. By turning the female form inside out, cutting up its psychological sequences with images and text, travelling through abbreviated materials in the body, she reveals structures “lack a design that can survive.” Within the body we are exposed to absent spatial positions and broken rhythms of action or sequence in the altered territories of human experience. This collection of work exists at the intersection of instruction and destruction, where spaces within the blueprint are upheld by words, connected with linguistic tissue and fractured points of intimacy between varied forms. Poet Akilah Oliver said “dwelling is the friction of stasis.” These pages ask how place can interrupt a liminal space? How does language create barriers with in the architecture of a space? Sue Hammond West and Pierce have created a space for language to conduct its own investigations on the body as dwelling. Images reveal where words collapse within these structures, whether they be emotional or visceral, thus allowing the reader to participate in a deviant form of investigative poetics. This collection of text and art explores the complicated nature of what exists both inside and outside of a single structure (the female body, a dwelling, a home, a spatial position) where language ruptures and breaks down inside itself. Within the pages of She, A Blueprint, Pierce carves out territories inhabited by lines that describe the interior of the body by using legend-like images and titles to help the reader navigate through the interior of both text and image. Based on Gordon Matta-Clark’s work with anarchitecture (abandoned buildings that Matta-Clark split or cut in two, often removing ceilings, floors and archways), the blueprint here maps the interrogatory space of the textual female body. Like Clark, Pierce divides each section of text into spaces labeled LOT or CUT that share pages opposite diagrams or parcels that reveal mapped spaces of interior lives. It is here that memory and language launch a full-scale examination with emotion, where fissured territory emerges like a festering wound in need of treatment. In one [LOT], Pierce writes, “She demanded to see the inside of the outside. The slit between the two. Determine whether the home was sound or an imposter with no walls, actually walls, but no foundation, actually foundation but no coverage . . . she attempts to construct a primary semblance of domestic reality,” emphasizing the importance of evaluating a structure for both sustainability and susceptibility in the midst of ruined moments or carpeting. “If the inside were outside and the outside the inside structure of this. Passage.” The corresponding legend that accompanies this quote resembles the female reproductive organ with a passage scale that reads: A Foot Equals The Length Between Wrist & Elbow.” Every [LOT] and legend allow the reader to journey farther into the space of the female body while representing that same space as every space as it exists in multiple structures, being both inside and outside of “a” narrative. Pierce cuts up images of silhouette with phrases like, “her alphabet scars the bodice” and directs language within visual structures seen opposite text: “Parcel D: Suspend The Grid’s Impulses Between Autonomy & Reliance.” Image and text are in constant conversation with one another throughout these pages, while leaving room for the ruptured rhizomatic space that remains in the unmapped narrative between map and legend. Hammond West and Pierce have strategically placed footnotes throughout She, A Blueprint, which creates a recurring visual space on the page, allowing for interruption of narrative with lines that construct borders on sonic and visual levels. Pierce says in a footnote, “Note: Abandonment, an unexpected trajectory in wagering.” This note serves as a reminder of the rapture and rupture of language, both spoken and unspoken in [LOT 8] and in the textual body of this work. “Around the corner of a room similar to hers. She found solace. Crumbs on counter. Flames on stove. All the names of all the names, she said. Normally this would have been historically relevant.” Pierce pays homage to Matta-Clark’s ideology about architecture as is evidenced throughout in her use of word play and the unique juxtaposition of architecture and relationships as they occur within a structure. in labyrinth. She in her, outside the blur of. forward. Outside the tension of a traced clue. She visibly part of a ghost effect. ANGELA STUBBS lives in Los Angeles and is a freelance writer and MFA graduate of the Jack Kerouac School at Naropa University. Her work has appeared in or is forthcoming from Black Warrior Review, esque Magazine, Puerto del Sol, elimae, Marco Polo Quarterly, Lambda Literary, The Rumpus, and others. She is currently working on a collection of short fiction entitled, Try To Remain Hidden.